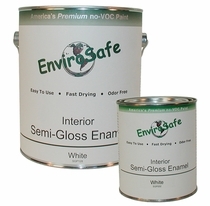 EnviroSafe™ Paint Co. produces premium quality paint and other coatings specifically formulated to improve air quality. One of the first premium paint lines featuring virtually no odor, no VOCs and no harmful fumes; free of formaldehyde, ethylene glycol, crystalline silica and treated municipal water. Interior Paint is available in flat (no gloss), satin (low gloss) and semi-gloss enamel (medium gloss). Both the satin and semi-gloss finishes are scrubbable. Exterior Paint is available in a heavy duty satin finish. Self-priming for most applications. Comes in almost any color. Sizing includes 4oz samples, quarts, gallons and five gallon pails. Easy to use, fast drying and satisfaction is guaranteed! Please pry open these links for complete details, pricing & availability!